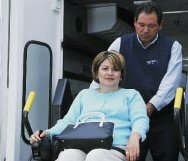 In cooperation with the American with Disabilities Act (ADA) of 1990, Monterey-Salinas Transit offers the MST RIDES ADA paratransit program to our customers who have a disability that prevents them from using MST’s regular fixed route bus service. Each of MST’s regular fixed-route buses is fully accessible and each is equipped with a wheelchair lift. If you believe that you are unable to use MST’s regular buses due to your disability, you may be eligible for the MST RIDES ADA paratransit program. A printable RIDES brochure is available here. Reservation requests may be made in advance until 5:00 PM daily for next day service or may be made up to 7 days in advance of the day of the trip. There are no restrictions on the purpose of the trip. Based on vehicle availability, MST RIDES ADA paratransit may need to schedule your trip within one hour of your requested pick-up time. Service Area: MST RIDES ADA paratransit service is provided within a service corridor that extends three-quarters of a mile from any of MST’s regular bus routes. Both the point of departure and the destination of each trip must be within a service corridor. MST RIDES ADA paratransit provides service throughout the Monterey Peninsula, Carmel, Carmel Valley, Salinas, Chualar, Gonzales, Greenfield, Soledad, and King City, and to the Watsonville Transit Center. Service Hours: MST RIDES ADA paratransit service is available during the hours of operation of MST’s regular fixed-route bus service operating within that corridor. MST’s regular fixed route schedule is subject to change. Other Information – If you need assistance, one registered Personal Care Attendant (PCA) may ride with you for free. Other companions must pay full fare and may ride as space is available. For reasons of personal safety and liability, our drivers may not negotiate stairs or enter private homes or care facilities. Both RIDES customers and registered PCAs must present a valid picture ID each time they board a RIDES vehicle. While these services are not part of the ADA Paratransit program (RIDES), they are made available to RIDES-certified customers to provide increased opportunities to meet their transportation needs. MST has established a taxi voucher program for persons with disabilities in accessing important locations within their local communities. If you are disabled and certified by the MST ADA paratransit program, you may qualify for taxi vouchers that can be used in the City of Salinas or on the Monterey Peninsula. Voucher holders must possess a photo ID from a government agency to redeem a voucher with an authorized taxi operator. Qualified persons can obtain information about the MST taxi voucher program by calling MST customer service or visiting here. Learn how MST’s ADA Paratransit Service (RIDES) has benefited individuals who cannot use MST’s fixed-route buses for at least some of their trips. After watching the video and reading the accompanying article, if you want to apply for RIDES and believe you qualify, the forms you will need to apply are found below. One form is for you to complete and the other is for your California-licensed health care provider. They can be filled out online, printed out at your home or office, then the signed originals returned to MST. Be sure to read the Application Instructions carefully before beginning the application process.